The benchmark NIFTY50 spent the earlier week in consolidating in a capped range but it utilized this week that went by in extending its gains. The Index saw itself ending on a robust note scaling new life time highs. The NIFTY ended the week posting net gains of 213.45 points or 2.00%. The coming week is the expiry week and it would be obvious that we will see the second half of the week remaining dominated with rollover centric activities. However, apart from this, going into trade next week, the NIFTY faces a tricky situation. We expect the Markets to remain volatile but trade with positive bias. 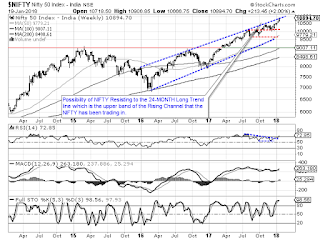 The NIFTY has currently tested the upper trend line of the 24-month long rising channel drawn from beginning of 2016. It would be extremely important to see if the NIFTY attempts a breakout from this entire rising channel or continues to just track the upper rising trend line. In any case, though volatile but range bound profit taking bouts cannot be ruled out, the overall intent of the Markets will remain generally bullish. The Markets faces resistance in the 10900-10975 zone and then at 11010 levels. The Relative Strength Index – RSI on the Weekly Chart is 72.8515 and it has marked a fresh 14-period high which is bullish. It does not show any divergence against the price. The Weekly MACD is bullish as it trades above its signal line. A white candle that emerged shows that the steady upward pattern is bullish. 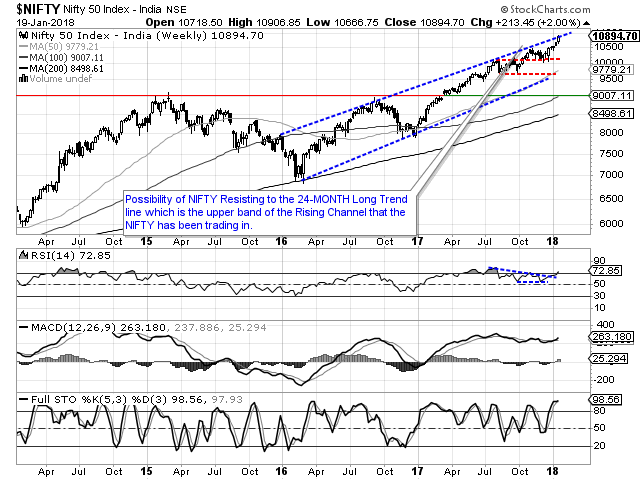 The pattern analysis shows NIFTY testing the upward rising trend line of the 24-month long channel that it has formed. It would be important to see if the NIFTY attempts to break out of that channel or simply keeps tracking the trend line posting marginal highs amid volatile consolidation. Overall, the lead indicator like RSI is seen breaking out of a pattern which is bullish. Further, the NIFTY has closed above the upper Bollinger Band on both Daily and Weekly Charts. This portrays great possibility of the uptrend continuing but the overbought nature of the lead indicators will require Market participants to also remain vigilant at higher levels. 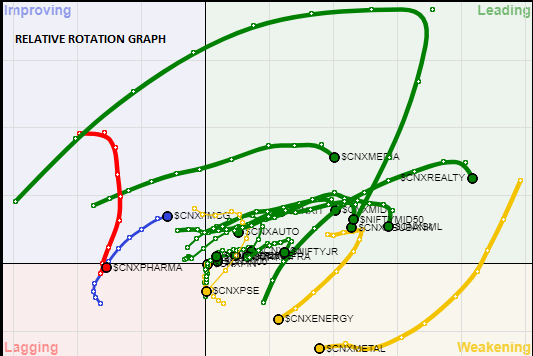 A study of Relative Rotation Graphs – RRG show that PSU Banks have continued to slow down on when seen on a weekly note. However, this week, we may see them consolidate and attempting to regain some momentum. MEDIA, REALTY, SERVICE Sector stocks along with FMCG may attempt to find base and relatively out-perform the benchmark. METAL, on week-to-week basis may pose no major show but might attempt to consolidate its position. No major action is expected from PHARMA and Public Sector Enterprises. Broader Indices may lose some momentum adding volatility into the trade. However, some stock specific out-performances may remain. 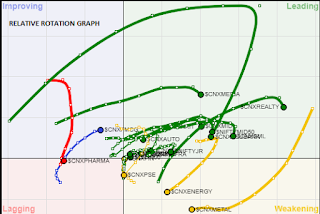 Important Note: RRG™ charts show you the relative strength and momentum for a group of stocks. In the above Chart, they show relative performance as against NIFTY Index and should not be used directly as buy or sell signals.